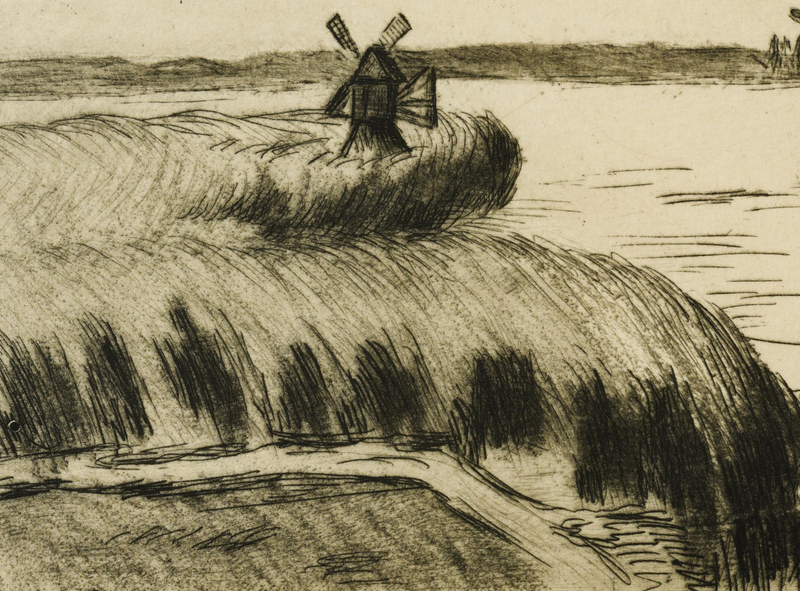 1st item: Felix Hilaire Buhot (French, 1847-1898) etching and aquatint with drypoint on woven paper titled "Gardiens du Logis", ca. 1898. 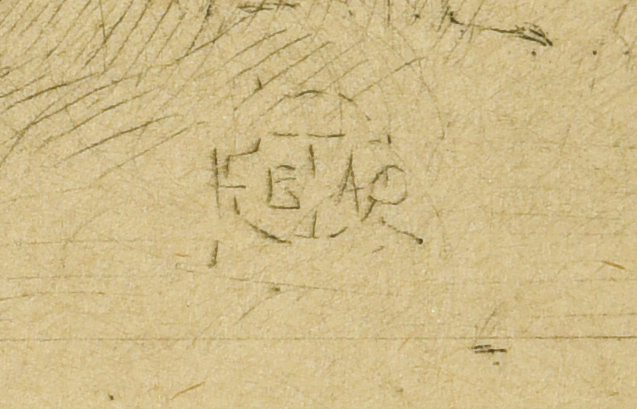 Signed with Buhot monogram in plate, lower right. Housed in wooden frame painted silver. 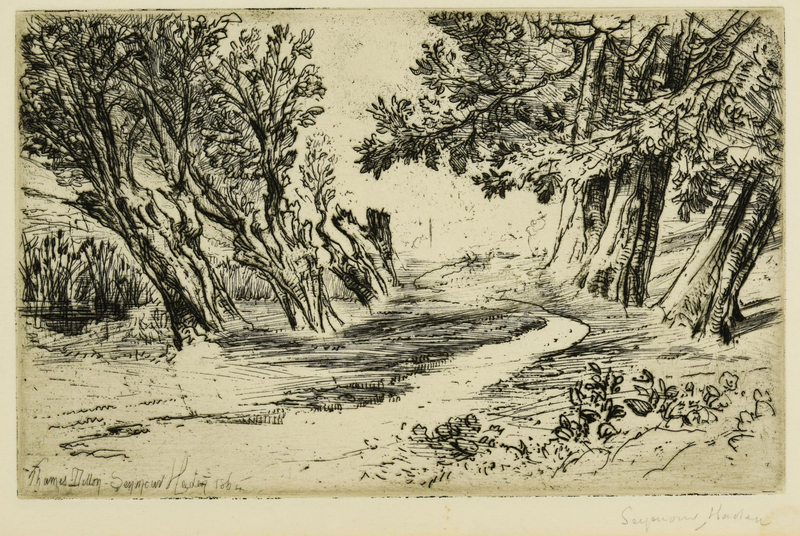 Image – 3-3/8" H x 4-1/2" W. Framed – 12-5/8" H x 15" W. 2nd item: Sir Francis Seymour Haden (English, 1818-1910) drypoint etching of "The Lover's Walk" in Thames Ditton, 1864, trial proof. 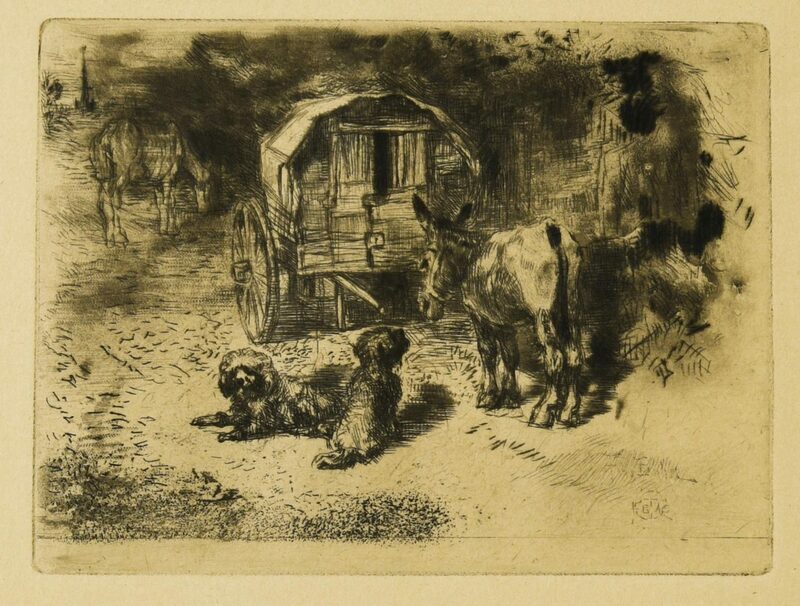 Titled in plate, lower left, signed and dated "Seymour Haden 1864" in plate, lower left, signed "Seymour Haden" in pencil under image, lower right. Knaffl & Bro., Knoxville, TN, label en verso. Housed in a wooden frame painted black and gilt gold. 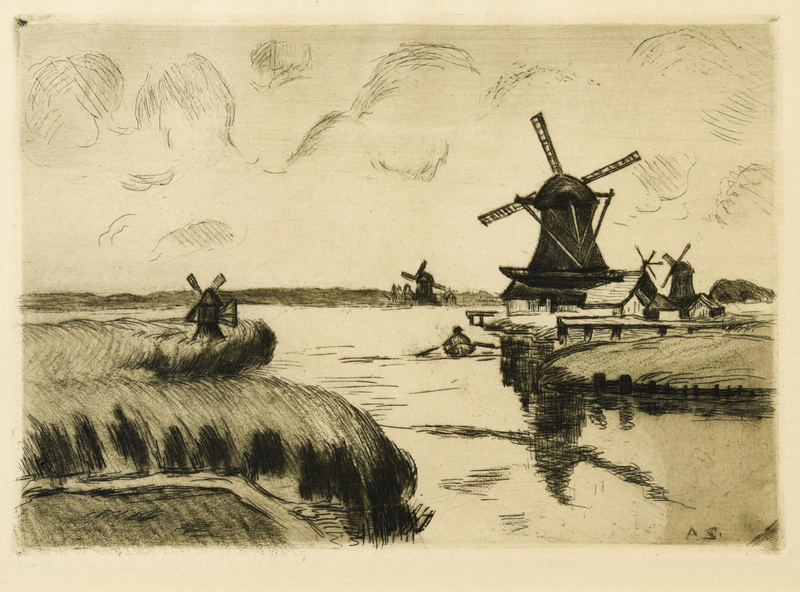 Image – 6" H x 9-3/8" W. Framed – 14-7/8" H x 17-7/8" W. 3rd item: Lithograph of a Dutch waterscape, featuring five windmills, a farm, and a man in a row boat. 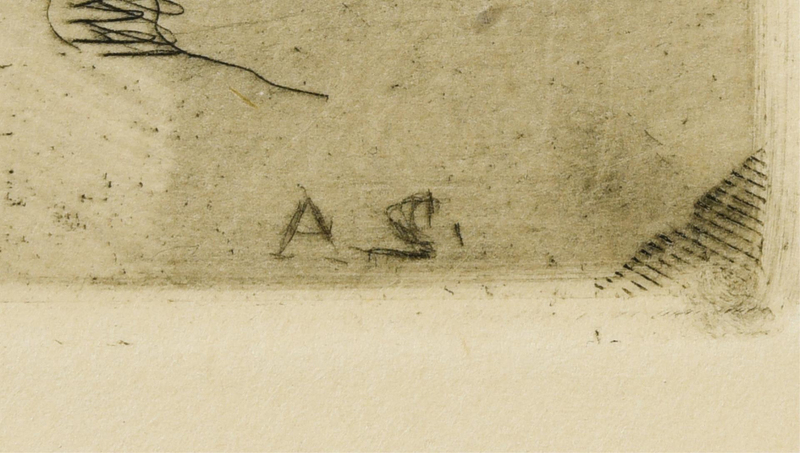 Signed with the initials "A.S." in plate, lower right. Defenderfer's, Oak Ridge, TN, gallery label en verso. Housed in a wooden frame painted silver and black. 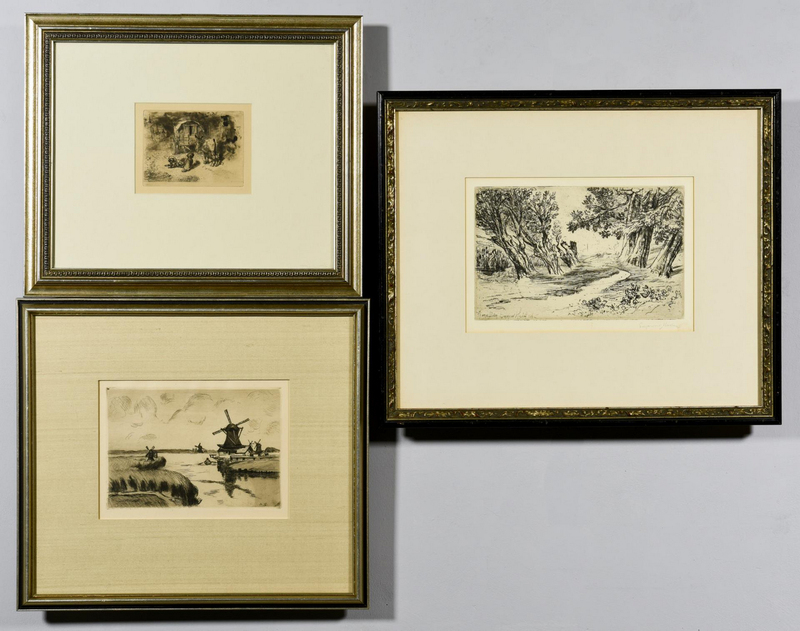 Image – 5-1/4" H x 7-3/4" W. Framed – 13-7/8" H x 15-5/8" W. CONDITION: 1st item: Overall excellent condition. 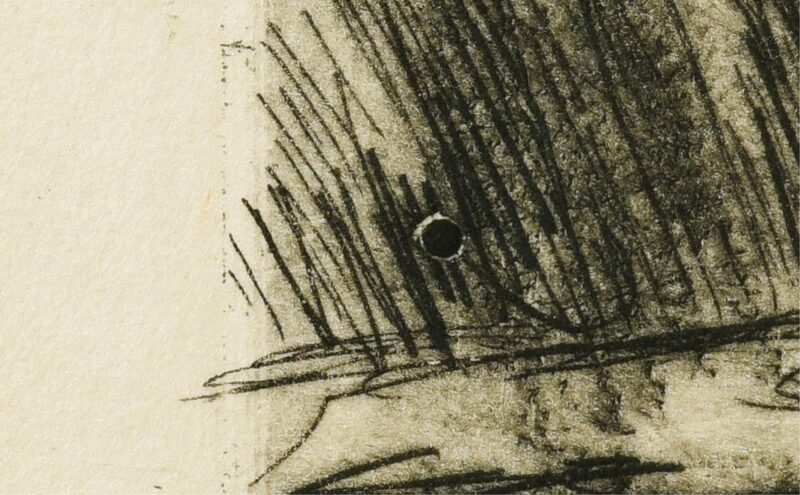 2nd item: Spot of possible water damage, under image, lower right near pencil signature. 3rd item: Overall excellent condition.